The UMass Football Media Guide generally ranks high in design. In 2008 the Media guide was ranked as the best cover in FCS/I-AA (pdf). Draft Daddy has David McCarty ranked higher than UMass' T ony Nelson in their "Top 10 Small School Running Back Prospects". Adham Talaat, who was one of the 19 players listed on the February recruit signing list is gone from the 2009 Spring roster. Richmond's Head Coach Mike London has received a contract extension to 2014. Over on the Bleacher Report, there's an article on "FBS Teams that need to beware of FCS in 2009". UMass gets an honorable mention with it's Kansas State game. UMass has missed out on another QB transfer, Justin Roper chose Montana over UMass, Towson, and Eastern Kentucky. Another article here . Roper had already used his redshirt year, so he would have only had two years of eligibility left had he come to UMass. The Boston Globe has an article on new St. Louis Rams head coach Steve Spagunolo. 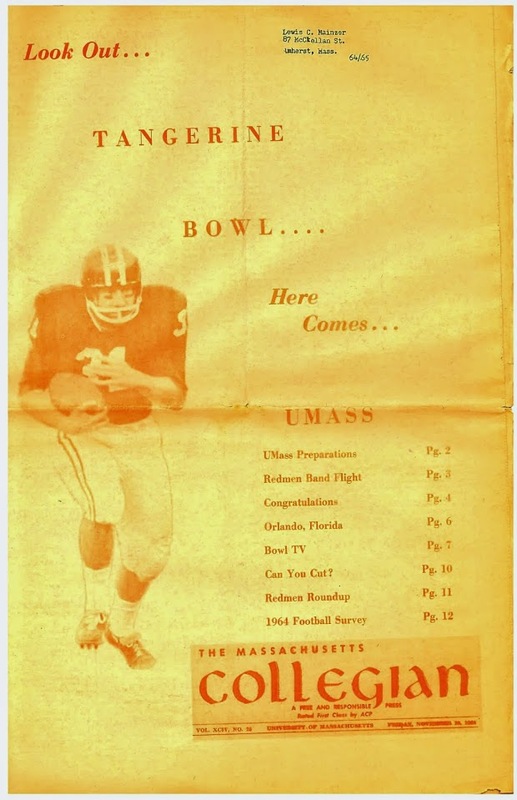 It mentions UMass several times including former UMass coach Jimmy Reid. The New Hampshire Football Report has a post that UMass DB recruit Christian Birt will not play in the the Shrine Maple Sugar Bowl in order to report earlier to UMass. Northeastern may move their home games to White Stadium in Franklin Park. Sports of Boston takes a look at the coming UMass- Kansas State game. The Worcester Telegram has an article about two 2009 UMass recruits: Brandon Potvin and Jesse Hunt. I don't think I ever published a link to this article back in February that mentions Potvin. Potvin we already know about as he was part of the 19 player class announced back on February 4th. He's a 6-1 240 pd DL from Holy Name in Worcester. Potvin was a member of the Telegram's Super Team and Central Mass Defensive MVP. Potvin had 298 career tackles. Hunt went 84-142 1,284 yards and 15TD's in his senior year. He was named to several Central Mass All-star teams. Hunt is 6-3 215. He will be a recruited walk-on . Welcome to both Jesse and Brandon! The Lehigh Football Nation has an interesting post about his attending the first ever conference on Sports Blogging. The title of the conference was "Blogs with Balls 1.0". I've blogged about Ron Villone before. The former UMass All-Yankee Conference and All-East TE appeared a couple of times for the Washington Nationals against the Boston Red Sox in the current series. His Nationals bio here. There's still a lot of turmoil going on at Kansas State. The Bedford Minuteman ( good name! 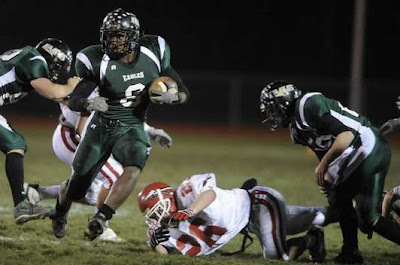 ), has an article about Ryan Carter a 5-11 185 pd WR/DB who will be joining UMass in the fall. The Blog likes that reported 4.4 40 speed. I've blogged about Ryan and his brother Woody before. Woody's North eastern bio here. Woody Carter is listed as a 6-1 185 pd WR on the Dean College roster. Woody had 6 caches for 161 yards, 26.8 AVE and 1 TD for Dean in 2008. I attended Monday's Friends of Football Golf Classic. So far this month it's rained eighteen out of twenty four days in New England. So the Friends had to battle through bad weather for the golf portion of the event. This was the second straight year of rain. As usual, everyone had a good time. One Friend even flew in from California to attend. Liam Coen was there as well as former UMass All-American and current Hofstra Coach Bill Durkin. Not a lot of football news from the event. Several UMass coaches were unable to attend because there were a couple of potential recruits on campus that day. Coach Morris said that UMass was still recruiting and considering some transfers for 2009. I spoke with Liam Coen and he said he recently worked out for the B.C. Lions of the CFL. He's also had some interest from the new United football league. Liam has already had one coaching offer. The Blog hopes Liam gets a chance to show what he can do for a program. A pair of links courtesy of the always interesting Draft Daddy. The University of Miami has learned the perils of over-using recruiting sites and the necessity of viewing game tapes-----not just the highlight reel. Josh Buchanan ranks this year's WR prospects for the NFL draft and Jeremy Horne is #11. UMass Athletics now has a Twitter page. Jennifer Broder, the Head athletic trainer for UMass football has won the 2009 Athletic Trainer Service Award. 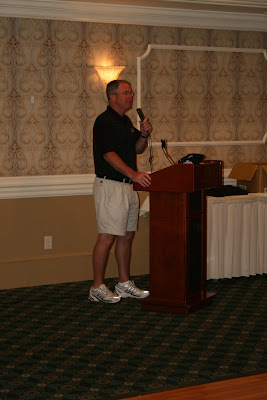 Coach Morris mentioned the award during last evening's Friends of Football golf outing and supper. The Richmond Times-Dispatch looks at Richmond, William and Mary and James Madison's chances against BCS/I-A completion this year. Richmond's coach Mike London looks at recruiting at the FCS/I-AA level. NFL's Total Access has an article on former UMass star Brandon London and his father. I'll be back tomorrow with some news from the Friends of Football meeting. UMass is recruiting William Fiacchi a 6-3 205 pd pro-style QB from Marcellus, NY. High school stats page and bio here . Fiacchi was third team All-State in 2008. He threw for 2,170 yards and 22 TD's in 2008 with a Liam Coen-like 62% completion rate. Receiving interest from a number of BCS/I-A teams including Boston College, UConn, Illinois, North Carolina, Pittsburgh, Maryland, Wake Forrest, Syracuse and Temple. MgoBlog has a wish list for Michigan's still unfilled opening date in 2010. Looking at the list, IMHO the only FCS/I-A teams that would settle for a "one-and-done" series are under the "Why bother" category. 'Course Michigan will have to pay them double what the Minutemen will get. The Michigan Daily has a comment about the opener and a remark on the UMass game. Josh Buchanan previews the Southern Conference. Will Appalachian State end up in the National Championship game after a one year absence? David Coulson has a new entry in his "Around FCS" column. It's called "Milking a new cash cow." Right now in the CAA, probably only Delaware and James Madison could afford the $100K guarantee. The Jacksonville Jaguars have added former UMass star Jeremy Cain to their roster. Maine's Jack Cosgrive will throw out the first pitch in Sunday's Redsox game. It will be Maine Day in Fenway. Mrs. Blog's family is from deep Maine. Way up on the St. Croix river. As a part of its Maine heritage, Bangor is offering a "Tommyknockers Tour". Mrs. Blog's grandmother believed in the Tommyknockers. "Last night, and the night before, Tommyknockers, Tommyknockers knocking at my door". The Ohio Valley Conference, the Big Sky Conference and the Southern Con ference have all scrapped "Media Day" in 2009 to save money. The Northeastern-Boston College game will be available over the internet from ESPN360. As you know, Verizon sold all of northern New England to Fairpoint Communications. It's not going well. Among its other faults, Fairpoint does not carry ESPN360, which I could get last year. A kind Blog reader sends us a couple of links about two of UMass' 2009 recruits. First up is a story about Sean Unterkoefler. Second is an article about Christian Burt. With the graduation of Karl Nelson and Chris Zardas after this year and the transfer of Korrey Davis to Liberty, Unterkoefler looks likely to be in the mix for the starting backfield in 2010. Speaking of recruits, this article says that Arlington High's Matt Wiley will be attending UMass this fall, but doesn't say exactly that he will be playing football. The Shriner's game will be held this Friday at Bentley. Anyone from the Blog going? The Virginia Pilot says that CAA football should just supersize it. The latest iteration of Josh Buchanan's "Top sixty small school prospects" has Vladimir Ducasse at the #3 spot, Jeromy Miles at #19 and Jeremy Horne at #32. Remember how Coach Whipple liked big offensive linemen? During his tenure at UMass the Minutemen had one of the biggest O-lines in FCS football. This article states that the Miami Hurricanes will have the biggest offensive line in BCS averaging 321 pounds/per man. BTW, Coach Whipple's Miami bio. * From the Spring CAA press guide. 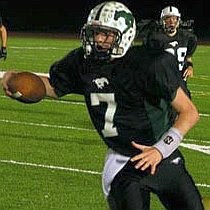 Back on April 18,2009, I did a recruiting post on Walpole RB Ryan Izzo. In this article, he reports his current favorites are UConn, UNH, UMass and Richmond. More on the agreement by Montana, Appalachian State and McNeese to play a series of OOC games against each other. The Blog's sister resides in Eugene, OR, so I kinda keep an eye on Duck football. I thought this article from Sports Illustrated was interesting. What do football players do when their playing days are over and they no longer need 6,000 calories a day? The article was brought to my attention over on Draft Daddy's blog. The sixth annual UMass Friends of Football Golf Classic will be held one week from today at Wachusett Country Club in West Boylston, MA. There is an application form and contact links on the Friends website. Dinner is available if you can't make the daytime golf program. The present UMass coaching staff will be there. Some former UMass coaches usually attend. UMass AD John McCutcheon usually attends. This is a great chance to meet the current UMass football staff and many stars from UMass football history. With the current recession, the Friends are needed as never before. Join up and support UMass Football even if you can't make the Golf Tourney. Please. Today is National Man Day. What could be more manly than supporting UMass Football? Send in your season ticket application and/or join the Friends of Football today! Appalachian State, Montana and McNeese have agreed to series of games. Article from the Appalachian State side here. From Montana side here. More on Georgia State's joining the CAA in football here. The Official CAA website article here (with a link to the Panther's press conference and photo gallery). Former UMass TB Matt Lawrence gets a mention in this article about the Baltimore Ravens training camp. Former UMass Safety James Ihedigbo's NY Jets Bio page has been updated. UMass has offered a scholarship to Matt Robinson, a 6-3 195 pd WR from Atholton HS in Columbia, MD. His Rivals page is here . ESPN has a story about him here. 2008 Highlights video here. Video interview here. Robinson hold offers from UMass and JMU. Drawing interest from Boston College, Maryland, North Carolina, North Carolina State, Pittsburg, Old Dominion and Towson. Josh Buchanan has posed his FCS Preseason All-American picks. Two UMass players make the first team: Vladimir Ducasse and Jeromy Miles. Hofstra gets a Syracuse WR transfer. If you follow New England football, Sporting News College Football magazine has AIC as preseason #23 in DII. The Yellow Jackets were 9-2 last year. The New Haven Chargers return to college football this year as they field their first team since 2003. Former UMass coach Mark Whipple took the Chargers to several DII playoff games and beat D I-AA UConn during his stint as the New Haven head coach. UConn gets new uniforms that are more like the ones they wore when the Huskies were in I-AA. UMass is interested in Jean-Dean Roussel a 5-11 172 pd WR/CB from St. Raphael Academy in RI. A story about him here. Also interested are UNH, URI, Northeastern and Boston College. The University of South Alabama is starting a football team this year. They will play FCS/I-AA football for two years (2010 and 2011) and then jump right into I-A football. Despite the fact that they have not played a game, the Jags have games scheduled with Mississippi State, Navy and Kent State. For the first time in a number of years, UMass does not have a recruit in the NY/NJ football classic. Phil Steele will 100+ pages of FCS/I-AA coverage in his Eastern Regional magazine this year (it was in the Western Regional last year). His national publication is due out today. There are very, very few active FCS/I-AA blogs out there. One of the few that is active is the Lehigh Football Nation and that site has a comment on Fordham adding scholarships. The latest version of the UMass Spring Football roster has some number changes. This weekend, Mrs Blog made me drive her on some household errands. To stop my whining, she picked up the 2009 edition of the College Sporting News College Football magazine for me. I can disagree with some of their material (picking UMass 3rd in the CAA North), but they did devote 17 pages to FCS football and they also cover DII and DII football. IMHO, it's one of the better college football mags. More on the Fordham move to scholarship football by FCS guru David Coulson. Note that the Rams will eventually fund 60 scholarships. That's more than the NEC will give. Being not eligible for the Patriot League championship will probably not hurt Fordham's chances for the playoffs as the tourney expands to 20 teams in 2010. If the Rams do well, they should be in line for a at-large bid. Fordham, coached by former UMass defensive coordinator coach Tom Mesella , is going to start awarding scholarships in 2010. They will stay as member of the Patriot League, but will not be eligible for the League Championship. Our 2009 OOC opponent Albany returns 14 starters from its 9-3 2008 season and has already been picked to win its third straight NEC Championship. An Oklahoma writer ranks all of the 2009 Big 12 games from 1 to 96. UMass-Kansas State is ranked 89 and the second ranked Big 12- FCS/I-AA game. Speaking of Kansas State, eight players were named to various preseason All-Big 12 teams. Chuck Burton in his "The CSN Way" column looks at the impact sports betting might have on Delaware and Delaware State. Montana may be in trouble too. JMU has eight players that will not return to the Dukes in 2009. In a move that will put a significant dent in UMass' running back depth, Korrey Davis will transfer to Liberty. Davis' UMass bio here. UMass is interested in Jimmy Owens a 5-10 190 pd TB from Westville, NJ. His Rivals bio is here. 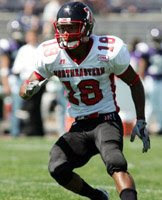 Owens had a 9.8 yards/carry average and 21 TD's in 2008. Sources say he has run a 4.45 40. Also interested are Syracuse, Villanova and UConn. More on Boston College's QB Dominique Davis' decision to transfer. His BC Bio here . CSN has photo galleries of FCS football. They've started the 2009 series. Over the last couple of years one of the best backs in FCS/I-AA football was North Dakota State's Tyler Roehl. He tore his ACL in a non-contact drill at the Seahawk's training camp. This article about Conference USA's efforts to reduce costs also has a lot of info about other Leagues as well. Note that C-USA may trim the number of players taken to away games and abandon staying in a hotel prior to home games. A summer gridiron report on our next opponent Kansas State. As you might expect, I spend quite a bit of time on the internet searching for material for the blog. Yesterday I found (courtesy of Any given Saturday) a new FCS site called "FCS Now". Apparently it's been in existence for a while. It never showed up on all those Google searches I did. Ten UMass seniors on the the Consensus Draft Services 2010 NFL prospects list. They also have a 2009 Preseason All-america list. I can't find the original webpage, but Appalachian State has the list here. Vladimir Ducasse is listed as a first team All-American. Victor Cruz, Tony Nelson and Josh Jennings are Honorable Mentions. Jeromy Miles is not on the list. Low level I-A teams receive about twice as much money as FCS/I-AA teams when playing BCS teams seeking a guaranteed win. I saw this link over on the Wizard of Odds college football site. UMass is #17 in the College Sporting News consolidated Pre-Season Rankings. Keeper's College Football Rankings has his Spring FCS 2009 Stats page up with percentages of 2008 team stats lost. Interesting stuff. The recession is making football at UNCC look like a tough sell. Texas Tech's RSFR Stephan Loucks a 6-1 179 pd QB has left the program according to the Red Raiders Blog Double-T Nation. He was a PrepStar All-American and threw for 13,000+ yards and 147 TD's in high school. Interesting story about ex-Duke guard Greg Paulus trying to become the starting QB at Syracuse.